Hope you all had a wonderful Mother's Day! Didn't have a lot of stamping time, so I'm combining Kitchen Sink Monday with MJ's TSSC69. I had this cool paper from Heidi Swapp in my stash that has map images and thought it would be perfect as a graduation card using the sentiment "Look out World" from Kitchen Sink Stamps 3 Step Graduation Set. "Class of 2009" is also stamped in Black with a SAMJ on the bottom of the stamped cap panel. I used the Cuttlebug Numbers Embossing folder and the CuttleBug Highlights Technique on the Burgundy Panel, adding the tab in Black using the Word Window Punch, and a 1/4" circle punched from the Heidi Swapp paper. Don't forget, you can save 10% at Kitchen Sink Stamps when you use discount code LISA10KSS. What a super Grad card. I love those papers and the Look out world sentiment. Great job Lisa! Thanks for playing. This is a stunner, Lisa! Excellent combination of challenges! What an exquisite graduation card, Lisa!! It looks so awesome created with these wonderful colors, papers, and textures!!! Such a remarkable design!! Such detail! I love the elegance you created with this card. Fabulous! 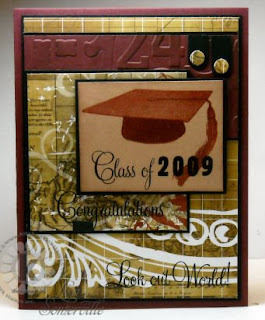 Very classy-looking graduation card! Beautiful work! Wow! What a striking design, Lisa!! The color combo makes the card very elegant and rich! I love it!! What a great grad card, Lisa! LOVE these papers you used!! Great graduation card, Lisa. The sentiment is a perfect fit.